First, Satan had a short victory over me yesterday. As you know, I blog on Mondays. Many of you also know that I take my topics seriously and pray about each one on Monday mornings. I do very little preparation as I do my best to remain open to the Lord’s Divine Will in what I post on my blog each week and yesterday was no different; however, once I was certain of my topic, I began to do some research and all hell broke lose! I knew immediately what was happening – Satan did not want me to follow God’s Will. No matter what I did, Satan was having no part of it and caused one break down after another…(except for me of course!). I continued on and remedied each problem as it popped up. No matter what I did though, another problem presented itself. After about an hour, I knew exactly what the problem was and it had zip to do with “technical” nor “operator error”. After about three hours of this evil insanity, I had finished. Done and Hallelujah! I was very pleased with myself and now all I had to do at that point was to hit “PUBLISH”; however, before I could, at that moment, my entire screen went BLACK!I No problem, I thought, since my system is set up to automatically SAVE my work, I would simply bring it back up from DRAFT. Since the issue was Satan-driven however, I quickly found out that there was no “saved in draft” for this particular Blog topic. Reeeally, now! Today is Tuesday and I’m back. Well now, here we go again my friends and yep, once again, the devil’s doing his damnedest to stop me, but I’m committed and hell will freeze over before I stop again. I WILL post this Blog today! I’m back with a vengeance of my own…an eagerness to right his menacing wrongs. YAY JESUS!! YAY me! YOUR FAITH SHOULD NEVER BE LESS THAN YOUR LAST MIRACLE! In the time of Moses, the Pharaoh, being operated by Satan, was afraid of being taken over by his slaves and ordered all male infants killed; in return God spared Moses and sent him to deliver His people out of Egypt. At the birth of Jesus, Satan used a King who was scared because he heard that there was to be a Messiah who would save his people and become King of the Jews. So this King ordered the babe be searched out and brought to him, but God gave three wise men discernment and Jesus Christ lived and thus gave His own life to SAVE the world and all who would receive Him. Regardless of one’s faith, where is the humanity in taking the life of an innocent, unborn child? An innocent unborn BABY!! With all the alternatives and opportunities available to one in the present time in which we live, abortion should be the last alternative. As a Mother, I literally shudder when I think of living my life without my two children. They have brought me such Joy (and not even to mention my five grandchildren in the mix), and I have no doubts whatsoever, that they are my two most precious gifts on this earth. As a Christian, I know they’re gifts from God and I’m so grateful, that when I think about these tiny, helpless, unborn babies, it just breaks my heart. I’m hoping you and yours will search your own hearts and if nothing else, please pray for a better solution for these helpless innocent babies. 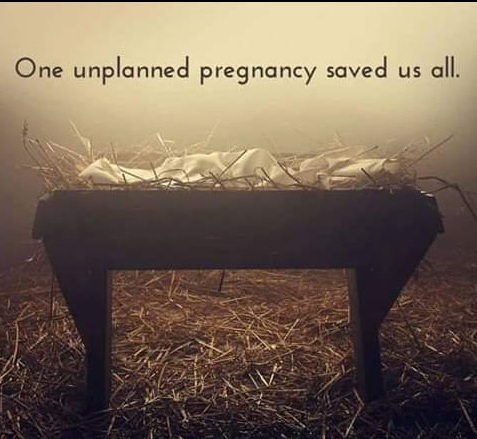 Let us not ever forget: One unplanned pregnancy saved us all…! This week, to all my Believers, let us all pray specifically and diligently for God to intervene in the horror that is back with a vengeance to besiege our nation in a way we cannot even imagine and may He have mercy on us all. *A special “Thank You”, to Michaela & Lee Wilkins for their faith & love for the Lord. This entry was posted in Uncategorized on January 29, 2019 by Author Margaret McBride. Welcome to my Monday Blog, dear Friends! Thanks for visiting and know that I appreciate each one of you. Please feel free to drop me a line now and then and share some of you with me! I was just thinking about the fact that we all make mistakes – All of us! We’re human…that’s the reason. No one holds the patent on mistakes. No matter how hard we work, how careful, thoughtful or responsible we are, sometimes we just need a “do over”, right? I’m pretty sure that today alone, I’ve made at least…let’s see now…OK, at least eleven mistakes…and that was before noon. What have I done about them, you ask? Well, a few of them were totally harmless and fixable…some were an immediate do-over and some are still in the process of being remedied; however, none of them were earth shattering. I have had days though, where a thoughtless, but honest mistake took more time than I was ready to commit in that moment, to fix, and I put it off. By the time I was ready to “fix it” it was a bit more “costly” than I was prepared for and nothing to do with money. This was one of those human errors that I failed to react to in a way that my actions (or lack of) would not be misinterpreted. Intentional or unintentional, when we’re the cause of someone’s pain, we must take a do-over and make it right…apologize, ask for forgiveness and move on. That’s the right think to do. This week, my prayer for us all is that we’ll ask our Savior to cause the Him inside us, to be thoughtful in all our actions so that they will not be in any way hurtful or thoughtless to others…and to help us to share a Christ-like personality in all we do. Amen! This entry was posted in Uncategorized on January 22, 2019 by Author Margaret McBride. Wow! Did I just write 2019 …again!? It’s always like this…takes me about a month to get used to the New Year! So, Happy New Year my dear friends and welcome to my first Blog of this new year! Actually, some days I don’t know if I’m going or coming no matter what year it is. One thing’s for sure, though…I do know who loves me, baby, and that my friends is what keeps me going – in the right direction! When we’re clear about the how we want to live our lives, the gift of Life is so much easier regardless of the mountains we must climb. That head-in-the-sand routine just never works out very well. I’ve been at the top of the mountain and at the bottom as well…the view from the top is so much better! I choose to consider myself a Warrior. ‘Course, Warriors have bad days too, but if you’re a Warrior for Jesus, you may lose a battle now and then, but you’ll never lose the war!! You’ll never be alone, you’ll always be loved and you’ll have your true best friend right by your side 24/7…imagine that! Maybe this new year, 2019, is your year to reach the top of your mountain. Be a Warrior for Jesus Christ. He died for You! He’s the real deal and He’ll never, ever, never leave you!! Be a Warrior and live for Him. Amen! This entry was posted in Uncategorized on January 8, 2019 by Author Margaret McBride.